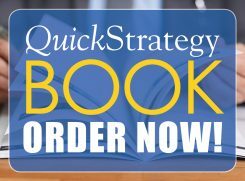 QuickStrategy, A Proven Method to Focus and Guide Your Business in Rapidly Changing Markets, 275 pages, 8×11 paperback, by Bruce R. Robinson. Click here to preview the book. Price: $21.95 plus $4.95 shipping and handling. Click here to order the book. The QuickStrategy Alert is a monthly newsletter available to members only. Price: Free to Members. Not available otherwise. QuickStrategy Forms Software, Microsoft Word based software and instructions for Market Battlefield Summary Form 1.0 and Strategic Plan Summary Form 2.0. CDROM for Microsoft Word 2000 or later. Price: $19.95, plus $2.95 shipping and handling. Click here to order software. These training seminars can range from half-day to three days depending on your need and the size of your organization. Contact us for pricing information. Venture investors, equity fund investors, and banks evaluating a new investment opportunity. Economic development organizations requiring a third party opinion on investment of public funds. Business acquisition specialists requiring an independent evaluation of acquisition candidates. Price: based on level of effort. Click here to request a quote. Competitor Analysis is offered only if the competitor is not also a subscriber to QuickStrategy services. The analysis includes targeted research to evaluate product or service offering, staffing, financial information, and strategic direction. It may include customer or employee contact. Click here to request a quote. A Prospective Market Evaluation is provided to customers interested in developing information on markets they may contemplate entering and provides a QuickStrategy market summary prior to entry. Click here to request a quote. A Market Alternative Evaluation provides a QuickStrategy analysis of market alternative products and services to identify trends and how they impact customer’s strategic plans. Click here to request a quote. A Strategy Risk Analysis provides independent quantitative and qualitative risk analysis of QuickStrategy plans in support of specific customer decisions. Click here to request a quote.